In all our years of travel, especially through Europe, we’ve seen a lot of churches, cathedrals, and basilicas. Like, a lot. And more than once, we’ve found ourselves quickly “churched out” after seeing a lot of the same architecture, spires and stained glass over and over again. I mean, churches all pretty much look the same anyway, right? You’ve seen one, you’ve seen them all. 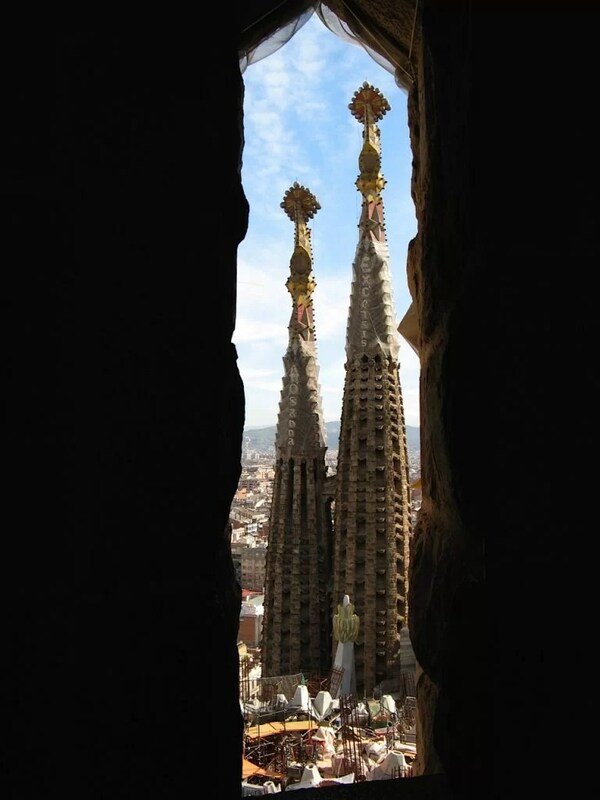 Then you haven’t seen the Sagrada Familia, in Barcelona, Spain. When Mark and I were planning our trip to Barcelona, friends who had visited previously told us we absolutely had to see the Sagrada Familia. We didn’t really know why it was special. Just another church, we figured. But we had the time, so we hopped the subway from our hotel to the area we had marked on our tour map. How could I possibly not have seen this gargantuan building looming behind me? Daaaaaaang. It’s like a melting sand castle. Who would have ever come up with such a surreal, bizarre design for a church? Antoni Gaudí i Cornet, that’s who. Antoni Gaudi was born in 1852. He was a sickly child, and he spent much of his childhood confined to his bed. He spent the time observing the nature around him, and took up drawing. This led to him going to school in Barcelona and receiving his architect’s diploma in 1878. One of his early commissions was to design street lamps for the city, as well as furnishings for some local churches. He went on to design apartment buildings and schools as well, but his main focus was on churches. The building of the Expiatory Church of La Sagrada Familia began in 1882 under a different architect, in the traditional Gothic revival style. But in 1883 Gaudi got the commission passed to him. For several years he worked on the project while taking on other building projects. 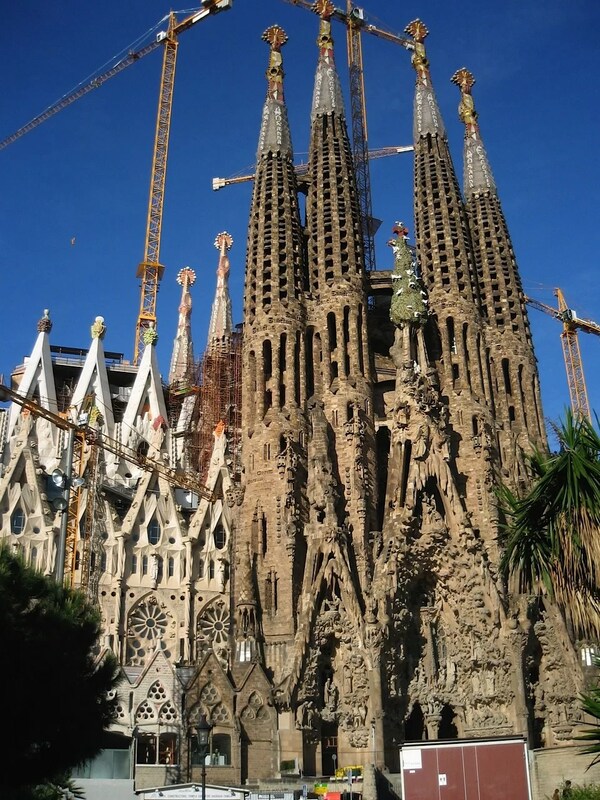 But after 1915 he devoted himself completely to the Sagrada Familia. One of the stories we heard about Gaudi was that he designed the church from images in his dreams. He sculpted his visions as they came, without even bothering to draw them or plan them out. But the fact was, Gaudi did, in fact create drawings and blueprints, as well as scale models to determine structure and massing. He was a great student of geometry, and he used innovative materials and techniques (for their time) to get the design just right. So although the end result may seem a bit willy-nilly and thrown together, Gaudi had a very detailed plan for the design. Yes, there was a method to this beautiful, jumbled madness! Unfortunately, in 1926 Gaudi was struck by a tram. He died three days later, at the age of 73. At the time, only a fraction of the church had been completed under his watchful eye. But his associate architects took up the work he left behind and continued his vision. The Spanish Civil War in 1936 halted the work, and Catalan anarchists destroyed parts of the unfinished basilica as well as Gaudi’s workshop and models. But construction picked up once more, and it’s continued in fits and starts ever since. With most of Gaudi’s original sketches and models destroyed however, much of what has been built since is largely based on speculation. The interior was still under construction when we visited. Want to see how it looks now? Keep reading! Gaudi designed the columns to represent tree trunks and branches. Honestly, he was a creative genius. Too bad not everyone appreciated his designs. Many thought the work was pure arrogance and an outrageous display of pretentiousness. Oh, and also ugly. 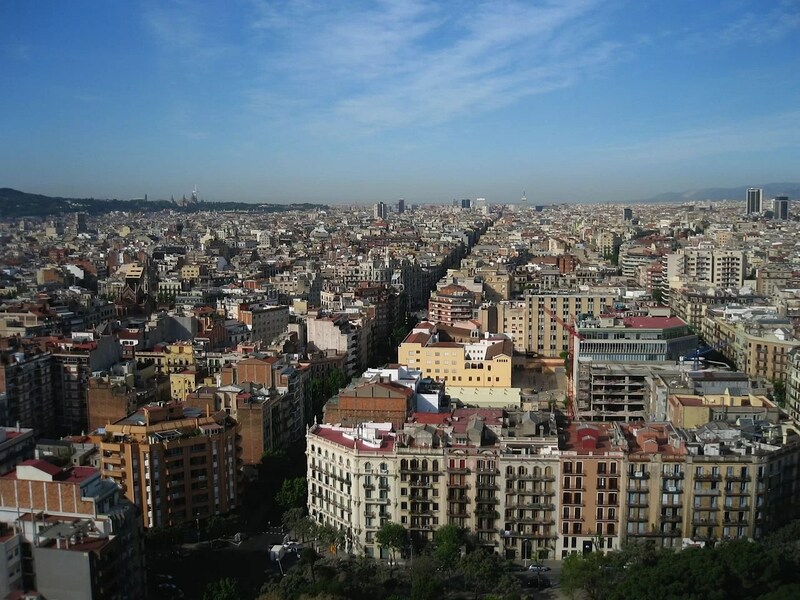 We also wanted to experience the view of Barcelona from the tower. Most church towers can only be reached by a winding, dizzying set of narrow stairs. But the Sagrada Familia offers an elevator to take you partway up. This took time because of the increasing crowds, though. Only a handful of people could fit at a time, so we had to wait our turn. 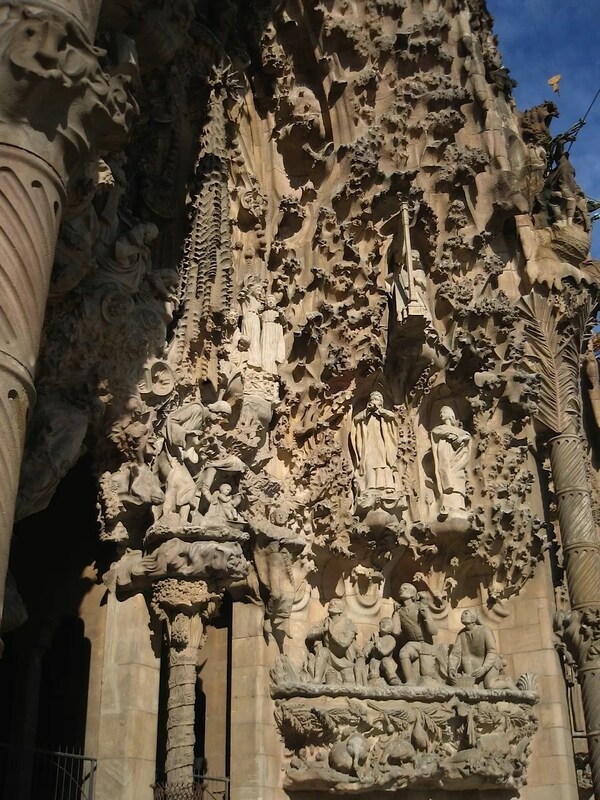 Gaudi’s original plan was to have 18 spires built: one for each apostle, the four evangelists, the Virgin Mary, and the tallest one representing Jesus Christ. Symbolism abounds in this amazing church. Note the words “Hosanna” and “Excelsis” on the spires above. Gaudi took advantage of every available piece of real estate to make the Sagrada Familia reflect the divine and holy wherever possible. It’s probably for the best that he wasn’t alive in the present days of neon lights and digital signage. The Sagrada Familia would look like Las Vegas. But still, over the top though it may be, it’s a stunning example of innovative architecture. Tips and Tricks: First off, this place gets NUTS with tourists. Over three million people descend on this attraction every year. Dozens of tour buses line up in front of the church all day long, and it can seriously slow you down and detract from the experience. But there are a few coping mechanisms. You can purchase tickets online at http://www.sagradafamilia.org so you don’t have to wait in line for tickets. When we went, we got to the church an hour before opening at 9am. This gave us time to have a coffee and a pastry across the street while still being close enough to get in as soon as the Sagrada Familia opened. By the time we finished our tour, the crowds were really getting bad. But we had escaped the worst of it by getting there first thing in the morning. Also, keep in mind that although you take the elevator up to the tower, you’ll most likely be taking the stairs to get back down (unless you absolutely feel you can’t handle the 400+ stairs; then you can probably take the elevator back down too). The stairs are narrow and windy, so for the sake of everyone, don’t bring big bags with you, including backpacks. Although the website says you need to check your bags, some people still had their backpacks on. And if they’re stopping to take photos on the stairs, it’s near impossible to squeeze past them. 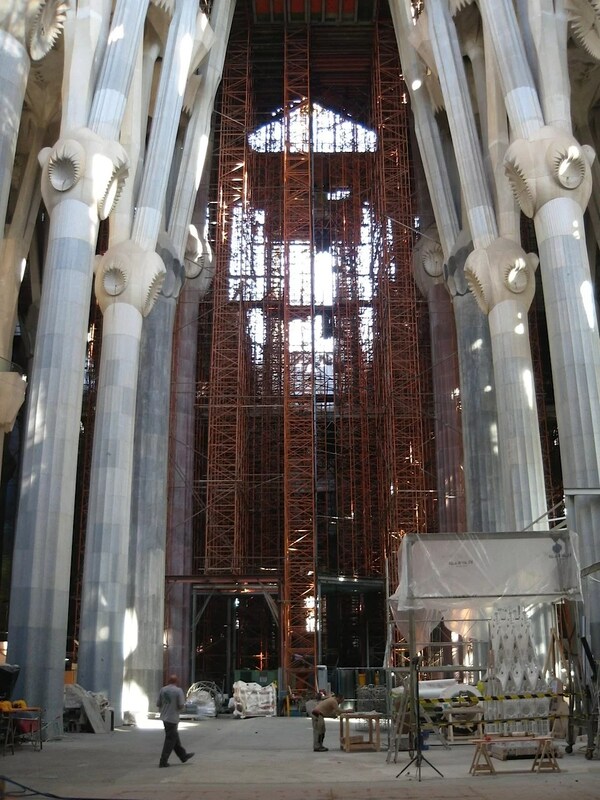 The church is still under construction, but should be completed in 2026 – in time for the 100th Anniversary of Gaudi’s death. November to February: 9 a.m. to 6 p.m.
March: 9 a.m. to 7 p.m.
October: 9 a.m. to 7 p.m.
On the 25th and 26th of December and the 1st and 6th of January: 9:00 a.m. to 2:00 p.m.
See the current rates for 2019 here.